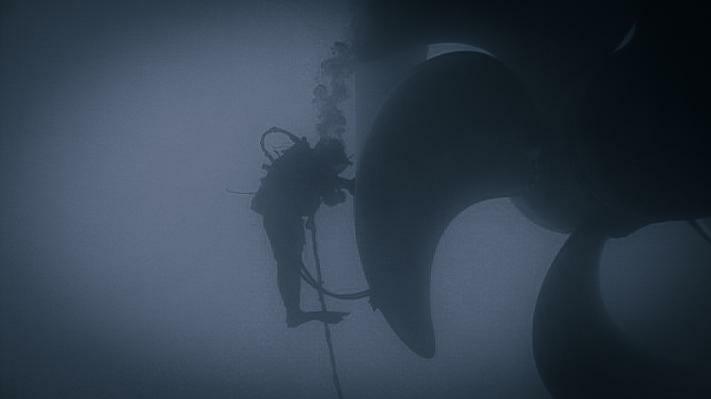 As with any non-painted surface on a ship, propellers are very vulnerable to fouling. By maintaining a smooth and polished surface the speed at which fouling occurs is significantly reduced. Moreover a reduction in surface roughness reduces friction and allows optimum propeller performance. The US Navy determined that propeller fouling can generate energy loses amounting to half that of the hull itself. 50% of fuel savings from hull cleans can be attributed to the cleaning of shafts and polishing of propellers. Why Choose Aegean Diving Services ? Our competitors favour diamond polishing. At a first glance this appears to provide a high quality finish. However the diamond polishing causes deep scours in the blade surface creating a good base for marine growth to form and adhere to thus resulting in increased drag and more frequent polishing being required. We at Aegean Diving Services use the latest in abrasive pad technology which meets stringent military requirements. Our equipment can provide a suction force of 100 kg to the propeller surface but can be manipulated easily around the blade surface by the diver. This combination of high power and fine abrasives results in a exceptional finish that can be delivered in a fast, professional and effective manner. Polishing can be provided down to 360-grade grit to produce a finish of 0.5μn Ra.